The oil painting Rain, by Sara MacCulloch, is in the Halifax artist’s new solo show at Studio 21, 1223 Lower Water St., to April 5.
essentials. She paints just enough to make a scene appear. It’s fascinating to go up close to the canvas to try to see how she’s done it with all those loose sweeps of paint, some thickly glistening, some scrubbed thin. MacCulloch evokes a powerful feeling of familiarity: I have been here before, I have seen this before, I have felt this before. Often the viewer is filling in details that are not present, like white clapboard houses and barns for Annapolis Valley buildings that are actually depicted as pure blocks of paint. "My paintings are of specific places, but the details aren’t important," says MacCulloch, in a press release. "There is something indescribable about a place that makes me want to paint it, and I try to make the painting as simple as I can, without losing that." 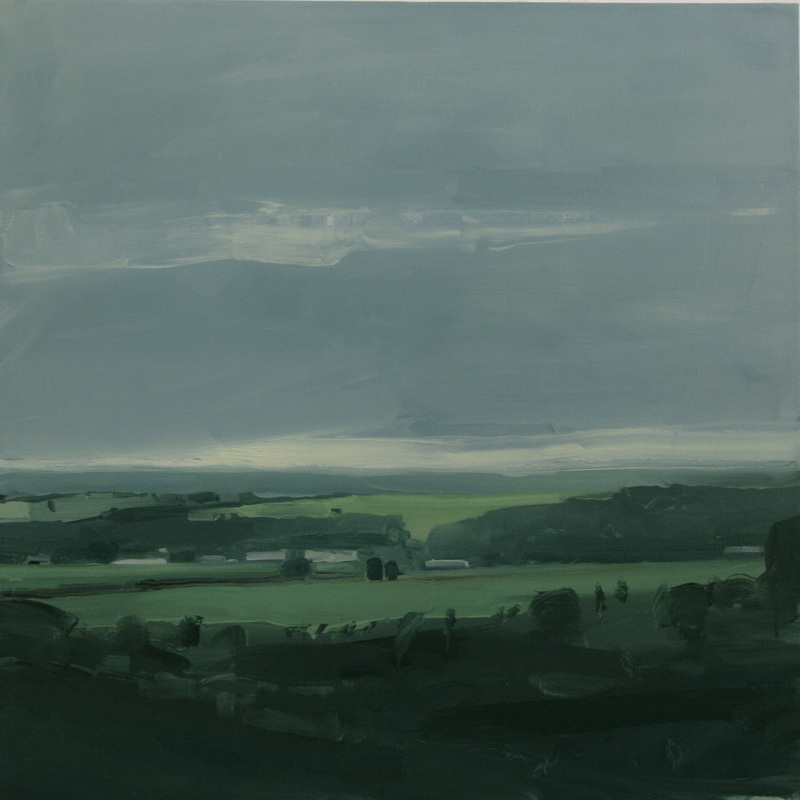 MacCulloch continues to work in horizontal planes with large skies for dreamy, open spaces particularly in her Annapolis Valley images that include the fabulous Rain. Road #2 goes back to her earliest paintings of roads that let the mind wander. Beneath a yellow custardy sky, a winding grey road is flanked by the dark and pale greens of trees and field. She pushes into new territory with near abstracts like the large and lyrical Trees with traces of paint for leafy branches framing an open space that includes yellow dabs for forsythia or whatever. It doesn’t matter exactly what it is. The dabs belong in the painting, as do all of MacCulloch’s marks. She never drops a stitch or tangles up a picture. MacCulloch varies her colours and her use of texture, always subtle, for paintings that range from a smoky dark blue sky with a large moon hung between birch trees to the pale sand beaches of the South Shore to farmland in ochre and acidic greens versus the dreamy blue greens, the colours of heartache, in paintings like Fields (Rain). NSCAD graduate her paintings have climbed in price — the largest pieces here are $4,000.